Everything went pretty well yesterday for Allie's Upper GI Series test. The doctor originally told me the test would take about 2 hours but in reality it only took 20 minutes. Allie refused to wear the hospital gown so she did the test naked - she thought that was pretty cool. The radiologist confirmed there are no blockages in her stomach. However he did say (preliminary) that her stomach had inflammation and that it was emptying liquids slow. That's about the only results I got from him. Her blood draw didn't go so good yesterday and Allie was very upset about it. It didn't help that the staff were not the friendliest and Allie didn't like them. They got her vein in the left arm first but then the blood stopped flowing. They moved the needle around for about 3 minutes when finally I said that was enough. They poked her right arm then and they got a vein after moving the needle around for a couple minutes. This vein was pumping. They were done and I was holding the gauze on her arm. I lifted the gauze to see if the bleeding stopped and blood was running everywhere. I freaked out and yelled, "something is wrong with her vein". Blood was pooling under her skin and also squirting out. They wrapped a tight bandage around her arm and called it good. She has a bruise from it but nothing crazy big, I kinda freaked out for nothing. But it was the first time I had ever seen anything like that - it was scary. Here are a couple pictures of Allie yesterday during her Upper GI Series test. Allie's nurse called us back yesterday afternoon with a new plan. Dr. Brown is concerned because of Allie's new symptoms so he requested that she get an Upper GI Series immediately. Allie is scheduled to have an Upper GI Series today at 10:30 at the local hospital. The test is non-invasive however it will be a bit uncomfortable because they fill her tummy with gas and then make her drink barium. The test will perform a series of X-rays to follow the barium through her esophagus, stomach and the beginning of her small intestines. They are looking for any type of obstruction or just anything out of the ordinary. According to the nurse, the test should take a couple hours. In addition, they will be doing extensive lab work at the hospital to check many other things. I haven't told Allie yet that she needs blood drawn - I'm going to wait until the last minute to tell her. If there is one thing she hates the most, it's getting her blood drawn. Poor pumpkin! We have an appointment with Dr. Brown on Monday morning so we should be able to receive her test results for her Upper GI Series and all of her blood work. Please pray that Allie's test goes smoothly this morning. I know it's not a difficult test but it's difficult for Allie because she doesn't understand everything that is happening. Thank you!!! This is day 3 and I still hadn't heard back from the doctor on how we should proceed with Allie. With her new symptoms not improving, I"m getting worried. I have called our nurse everyday and requested they get back to me but nobody ever did. Finally this morning, I had enough!!!! I just got off the phone with our nurse and she could tell that I was getting upset about not getting an answer from them. I told her I needed an answer today or I would be in the waiting room waiting all day to see Dr. Brown. She promised me she would get with Dr. Brown (no matter how busy he is) and sit down with him and discuss all of Allie's symptoms. She would get back to me before the end of the day. In addition, Allie is scheduled to have a weight check on Monday at 10:45, she is going to make that a regular appointment instead of just a weight check. She said that Allie has too many new symptoms to just handle it over the phone - I agree with her 100%!!! So, we should be getting some sort of plan from Dr. Brown this afternoon. That's a relief - we'll see what his thoughts are. I put Allie on the scale last night and she was 26.6 pounds :( Poor pumpkin has lost weight yet again. Now I'm really stressing because she was 27.4 pounds at her last visit in December. As I told our nurse, I am not able to give Allie her full feedings because once I get over 3 oz, she is screaming that she cannot handle it. Her tummy hurts and she's going to throw up. 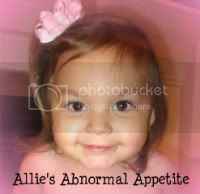 In addition, Allie has been vomiting solid foods that are just sitting in her stomach so that's lost calories also. Uggggg......it's always a weight battle!!!! Allie's behavior has been something else also - it's gotten a bit worse. I really believe she is in pain. At night I have had to give her Tylenol just to sleep. She is very attached to me AGAIN and won't leave my side. Just last night I was running to the store, there was no chance she was staying home with Matt. She had to come with me, she just cannot leave my side. Today I was bringing her to school and all she did was scream that she didn't want to go because she wanted to stay with me. Yesterday she was laying in bed, woke up and threw a tantrum because I wasn't right by her side. Matt walked in there and she was so mad because she wanted me and not him. He tried helping her but she ended up pushing and kicking him and just screaming harder. The minute I walked in, she calmed down. Allie has always been attached me and she doesn't like very many people, but to be this attached all of sudden is alarming. Something has got to be going on with her and I just don't know what. Praying for answers!!!! A quick update from my last post, Allie's black stools were caused from constipation. I ended up giving her Ex-lax one afternoon and she was up all night pooping. After that, she didn't poop for 4 days but once she started it was back to normal. So, it turns out the medication was not causing internal bleeding in her stomach - what a relief!! 1) She complains daily of a stomach ache. Allie previously never complained of tummy pain, now it's daily and it really seems to bother her. She normally lays down or just wants to be cuddled when her tummy hurts. 2) She is randomly vomiting. Seems she is throwing up solid food from hours and hours ago. Food that no doubt should have been digested. Allie had been vomit free for a year and now she's starting to vomit randomly. It's never during a feed though - this is something different. Her vomiting is forceful, it's not a vomit like when she has too fully of a tummy from her feedings. When she first started the vomiting, I thought she had the flu, but it went on and on and it was random. 3) I cannot get her to eat barely anything and even more strange is I cannot get her to drink her milk. Allie always drank a fair amount of her formula (milk) each day, now she won't touch it. She only will drink water. Of all things - water!!!!! Don't get me wrong water is good for her but I wish she would pick a liquid with calories. With these 3 things happening all together and they have been going on for a little over a week, I have decided to stop her medication (the one from Canada) immediately. So as of Friday, she has been done with her medication. I'm assuming it will take several days for the medication to get out of her system. As of today, she's still complaining of belly pain, she won't drink her milk and she is still randomly vomiting. So, I'm not sure what is going on but I'm not liking it. The other thing that is possible is her tummy is shutting down more. She might be not be able to handle any solids at this time and maybe her rich milk is causing her to have stomach pains. Praying her stomach is still functioning at the 16% or higher, but from the symptoms we are seeing, it's somewhat unlikely. I'll be keeping a close eye on her and talking with her GI doctor again. Right now I'm not freaking out but if this continues even after the medication is completely out of her system, I will be stressing!!!! Allie is having accidents in her pants now. Every evening she is pooping in her pants. Each time, she freaks out because she doesn't like it. I asked her why she's pooping and peeing in her pants and she said she doesn't know why. I feel bad for her because I don't think she's doing it on purpose. In addition, her stool is black and tarry. We don't know if the medication is causing this or if it's because she's slightly constipated. Her GI doctor, Dr. Brown ordered a stomach X-ray immediately on Tuesday and it showed mild constipation. I gave her milk of magnesium and she had one bowl movement yesterday but then pooped in her pants again in the afternoon. Domperidone can cause stomach bleeding so we have to watch her very carefully in case she has bleeding in her stomach. With her black stools, the doctors aren't sure exactly what is happening. The plan for right now is to give her ex-lax and hopefully that will clean out her system. If she continues to have black stools after that, we will need to do a stool study right away. Per the doctors request, we are continuing with the "Domperidome" unless she shows signs of a fever or anything else. As many of you know, I have struggled with Allie's behavior since she was born. Allie was born being stubborn and strong willed. Part of me is happy she's like this because as we all know, a child with medical issues is normally strong willed and stubborn and they beat the odds. However, 3 years of fighting this behavioral battle with Allie and I'm at my wits ends. Between dealing with Allie's behavior issues and being in charge of her feeding and medical issues, I've got my plate full. I am the one who primarily parents the children since Matt works outside the house and I'm the sole one who tube feeds Allie. Not sure why my husband thinks he doesn't have to tube feed her but he hasn't given her a feeding (or medication) in I don't know how long. Even on the weekends, I'm the one who gives her all her feedings. Sorry Matt, I'm throwing you under the bus but I'm only stating the truth! Anyway, sorry for that soapbox, but after witnessing Allie's behavior everyday, I'm convinced there is something wrong. I set up a special appointment with her Pediatrician to discuss her behavior and to get suggestions on how to help us out. 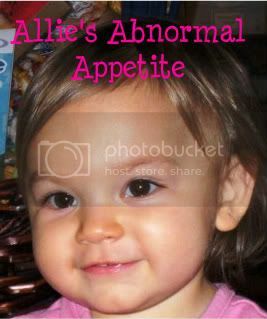 Her Pediatrician thinks Allie's behavior is normal and it's typical for her age. Ummmm.....I honestly don't agree with that. I don't want behavioral help for Allie simply for my sanity......no, it's bigger than that. I have two major concerns when it comes to Allie's behavior and if one of the items below is true....I would feel awful if I didn't get her help! 1) She could be depressed and we don't know it. With having medical issues and no control over them, maybe she is generally just not happy with life. If she is depressed, I want to make sure we figure it out and help her the proper way. Allie receives a ton of love and affection, especially from me since I'm generally the only person she likes on a daily basis. However being depressed sometimes requires more than just love & affection. 2) She could not feel well. It's possible Allie just feels crummy all the time, maybe her tummy hurts, etc. So, she's just unhappy because she's constantly in pain. She doesn't complain of being in pain but I do know her pain tolerance is extremely high. So, maybe she's just developed a new normal which includes pain and that is why she's acting out. No matter what is actually going on in Allie's head when her behavior goes astray, I will continue to push for answers. I need to make sure that Allie is okay! I've contacted Dr. Morhland, a Neuropsychologist in Wausau and I'm hoping to get in with him sometime this month. I will push for answers and maybe I'm totally wrong and Allie's behavior is age appropriate, but honestly if her behavior is age appropriate now, I'm dreading the day she's a teenager - lol.